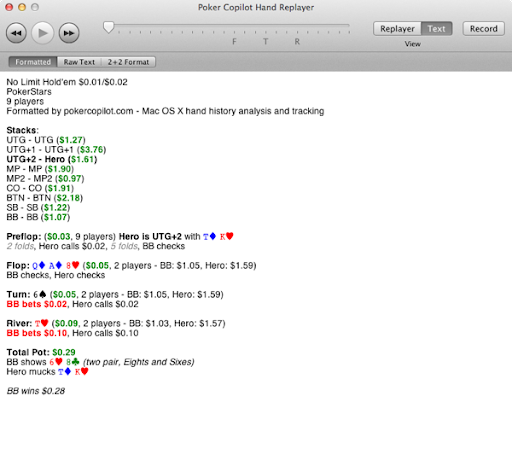 In the next Poker Copilot update there will be two small but important changes to the hand formatter. 1. Players are now anonymised. This is in keeping with poker forum etiquette. 2. Stacks change throughout the hand. Each player’s revised stack is now shown at the beginning of each street. This gives you an idea of how much a player’s current stack they are betting. Note that the second change is only in the “Formatted” view at the moment. I’ll introduce this to the “2+2” format in a future update. Here’s an example of me being a calling station with KTo. Thanks to loyal Poker Copilot customer Gregory for suggesting these changes.